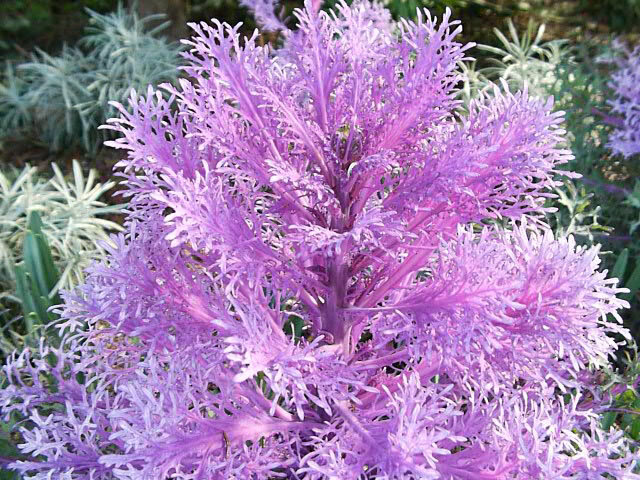 These annual plants are very showy, and come in a variety of colors, ranging from white to pinks, purples or reds. 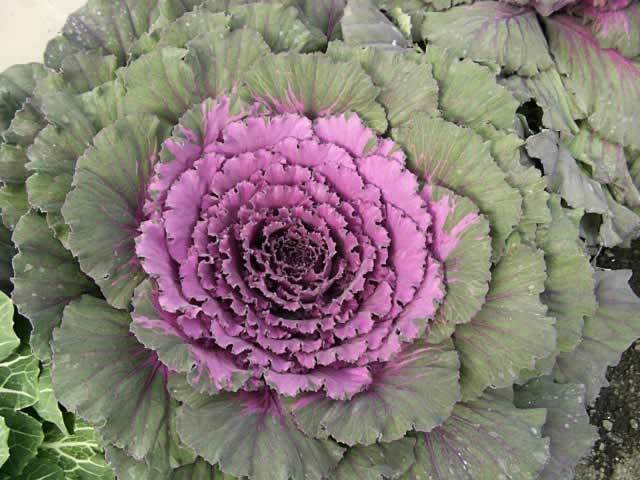 Ornamental Cabbages and Kales look much the same as their edible cousins, but the ruffled foliage is much fancier and more colorful. Brassica plants do not tolerate summer heat well, but are extremely cold-tolerant. They can survive winter temperatures as low as 5° F. if they are gradually acclimatized. 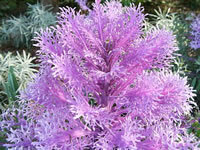 While a sudden cold snap can be deadly, light and moderate frosts will intensify the brilliant coloring of these plants. 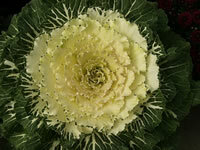 When purchasing ornamental cabbage or kale, look for a plant with a short rosette-type stem. Generally, if these plants were allowed to become rootbound in their pots, they will not get much larger after they are planted, so it may pay to buy the biggest plants you can find, even though they may cost more. These plants can be grown indoors in a large pot. However, the length of time that they will last in the home will vary, depending on the temperature. A brightly lighted, cool room, is the best location. Kale and Ornamental cabbage plants prefer cool weather. Although Kale plants may be set out in the spring and allowed to grow through the summer, the best time to plant them is in the early fall. Planting Kale in August or early September will allow the plant to become established, but if the temperature isn't cool enough, this will result in a leggy, relatively colorless plant. Planting before the first frost also means that you will have to contend with cabbage loopers, which bore unsightly holes through the plant. The intensely colorful pigmentations that Kale plants are known for do not appear until after prolonged cool weather and a few frosts. 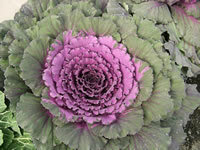 Ornamental Cabbage and kale should be planted in a sunny location in a moderately moist, rich soil. 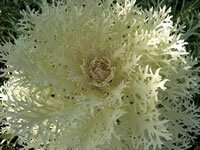 Growing Kale and Ornamental Cabbage from Seed. Kale seeds require light for germination, so DO NOT COVER THEM with soil. It is best to sow Kale seeds directly into the garden, where they are to grow. The exact timing for sowing and planting will depend on your local conditions. 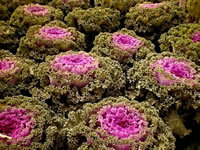 Sow Kale seeds about six to ten weeks before the first anticipated frost. Plant the seeds in rows, spaced 18 to 24 inches apart, allowing 6 inches between seeds. Keep the soil moderately moist during germination. The seeds will germinate and sprout in one or two weeks, depending upon weather and soil warmth. When the young plants are about 3 inches tall, thin them out leaving the strongest and best plants spaced about 18 to 24 inches apart. 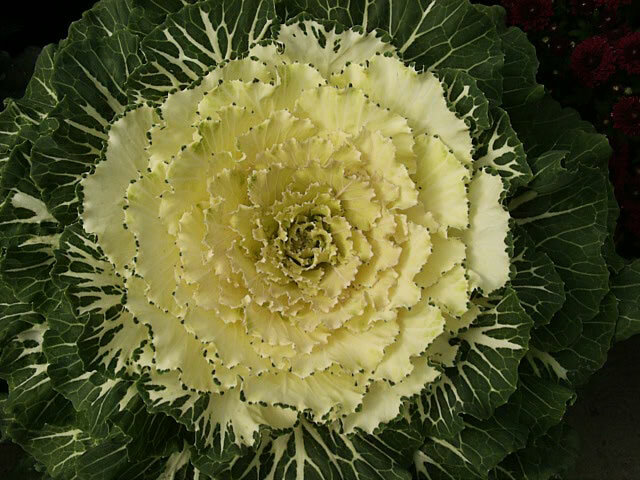 Although Kale and Ornamental Cabbage seeds can be sown indoors at any time of the year, without cool temperatures the plants won't attain much color. For starting seeds indoors, I recommend that they be sown directly into a large 6-8 inch pot, to avoid the problems associated with transplanting. 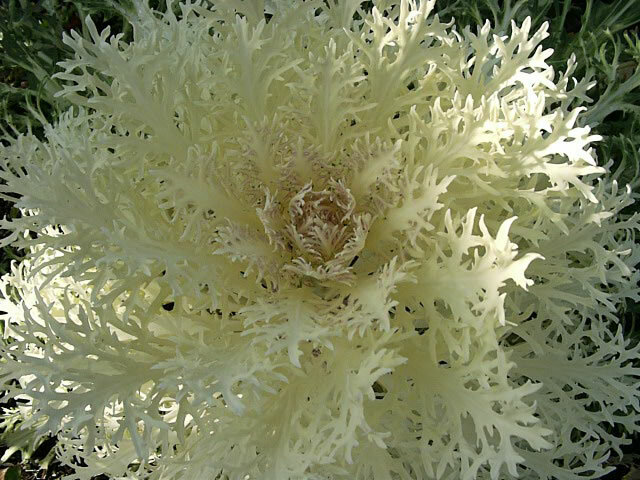 Once the seeds of Ornamental Cabbage are sown, place the flat or pot in the refrigerator for 3 days to expediate germination. Flowering Kale does not need this pre-chilling period.